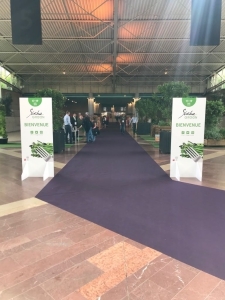 Ecocook went to GL Event’s Sirha Green in Lyon from June 17th to 19th . 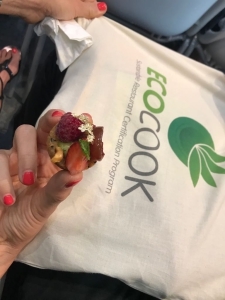 Organic food, veganism, vegetarianism, energy-saving technologies, and social and environmental responsibility were in the spotlight at this unmissable event. Sirha Green was composed of many exhibitors, different spaces and scenes where we could attend exchanges on various themes such as sustainable and responsible development, the waste management and wastage, recycling and bio- waste, but also responsible recipes, made in live, by well-known Chefs such as Giovanna Grossi, Régis Marcon and Guillaume Sanchez, among others. 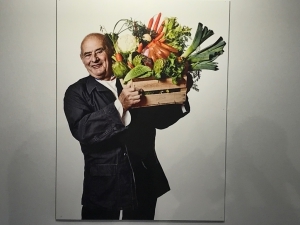 The Paul Bocuse Institute, founded by the later Grand Chef Paul Bocuse (Best Worker in France, 3 Michelin stars since 1965 and elected Chef of the Century) and Gérard Pelisson (Co-founder of the Accor Group) was also present at Sirha Green and proposed through “Table Green”, four dishes to avoid food waste around an original and greedy menu format “Very Hungry” and “No so hungry”. 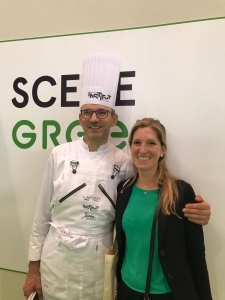 “Table Green” was driven by Institute Paul Bocuse Chef, Olivier Pons, from the Restaurant “Experience”, and his team of students. 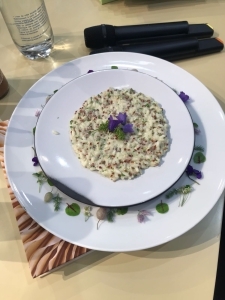 Monday, June 18, the show hosted “The Great Chefs’ Picnic”, bringing together 200 Great Chefs including Jerome Bocuse, Paul Bocuse’s son, Edouard Loubet, Frédéric Berthod, Nadia Sammut, Serge Vieira, Eric Briffard or Christophe Marguin, around a menu prepared by Emmanuel Renaut ***, Marc Veyrat ***, Jean-Rémi Caillon **, Michaël Arnoult ** and Louis Chabran *. 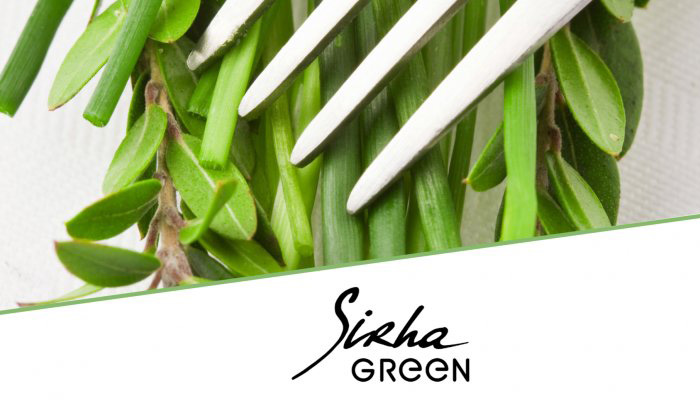 Now, we present the different key spaces of this Sirha Green 2018 show. 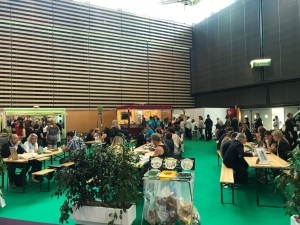 First of all, at the heart of the show took place the “Agora Green”: a dedicated space for culinary demonstrations by chefs from the “Cuisine Green”. 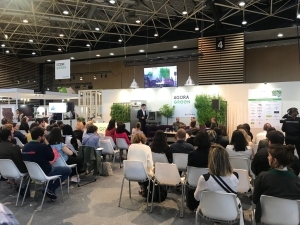 There were also discussions and debates where professionals from the industry and the crafts, aware of the major issues of sustainability and responsible catering, and who touch the world of catering came to present their experiences and success stories, new expertise, discover new models, find solutions to their product sourcing concerns, waste management, sustainable production. 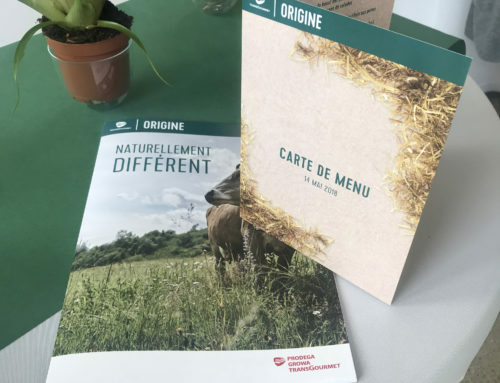 Inspired by the concepts present at La Commune, the Paul Bocuse Institute team offers a gourmet menu composed by strong identity dishes: vegetarian, local, exceptional and innovative products. They wanted to enhance the place of the human being by offering entertainment throughout the day (coffee-citizens and concerts in the afternoon). “Very Hungry” and “No so hungry “ offerings made it possible to adapt to everyone’s food choice and avoid waste. In-room and kitchen textiles are locally made. Signage and equipment have been designed to facilitate recycling, sorting and customer experience. « Innovorder » facilitates taking orders using its terminal and its order taking site. Thanks to compostable dishes, and its bio-buckets, the Green table is able to limit waste. 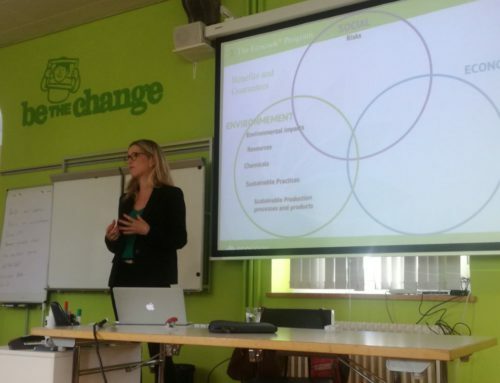 Bio-Waste is valorized into composting in short circuits. The other products are made from recycled components and are recyclable. 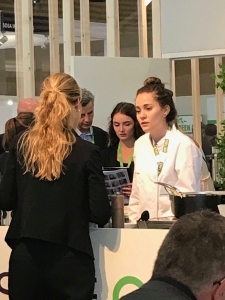 You would have understood it; this first edition of Sirha Green was an excellent testimony of the exponential growth of the sustainable food service interest and market. And, as you know well, a sustainable restaurant is a restaurant with a 360° sustainability approach, which uses local, fresh, seasonal, and healthy products. 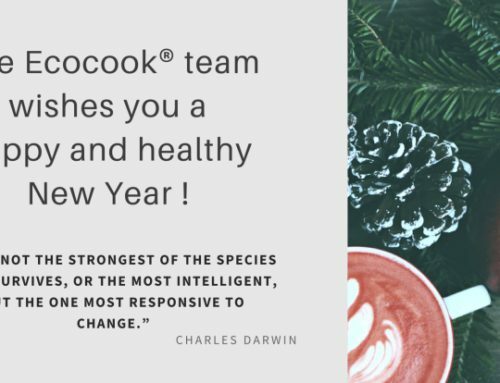 Moreover, a sustainable restaurant is the one that uses biodegradable cleaning products ; reusable dishes, recyclable packaging and dreams about prohibiting plastic within its restaurant but may not know how to do it so. A sustainable restaurant questions itself and sets goals for improvement in sustainability. 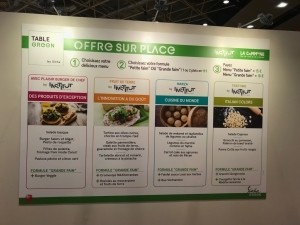 New restaurants need to integrate these principles of sustainability; these optimized operational procedures, facilitated by efficient technologies and smart cooking facilities. 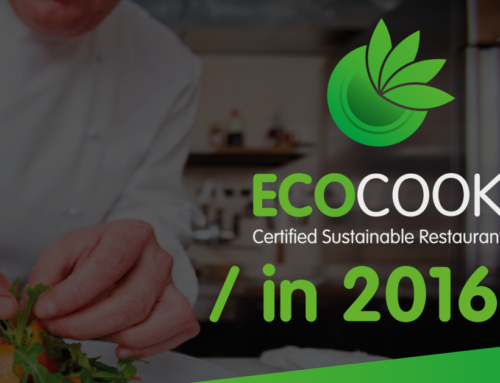 Tomorrow’s responsible restaurant owners are already here today, and are Ecocook certified. 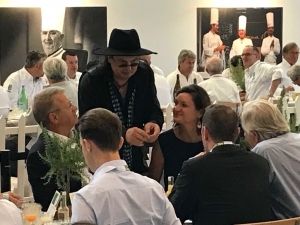 Now, the customer can also select his future culinary experience in a responsible way, reducing his personal footprint, and contributing in making our world a better place. The committed restaurant owner receives his well-deserved reward for his excellent and sustainable best practices. 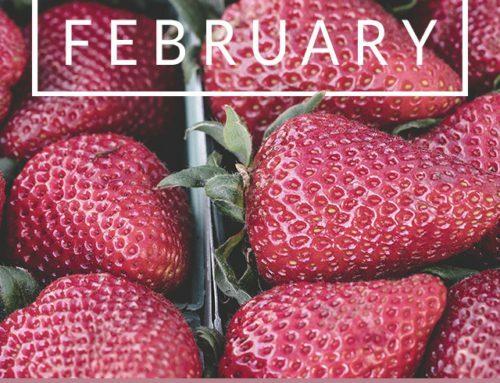 Together for sustainable production and consumption. We look forward attending next edition!